"The 2011 SFD/L29 stair climb team competed in the annual Columbia Tower Stair climb in Seattle. We raised almost 25k for the Luekemia/Lymphoma society, which was 2nd amongst all the teams who participated! The event although a competetion amongst firefighters is primarily intended for fundraising for the cancer society." Kinda lame. Come on! Where are the stories?!?! Where are the pictures!?!? Inquiring minds want to know what 2011's event was like before 2012! March 25th, 1911, 146 garment workers lost their lives in one of the worst workplace disasters in American history. Join us for a rally to remember this dark day in the history of the American labor movement, and support our continued efforts to advance the cause of the working class in America. 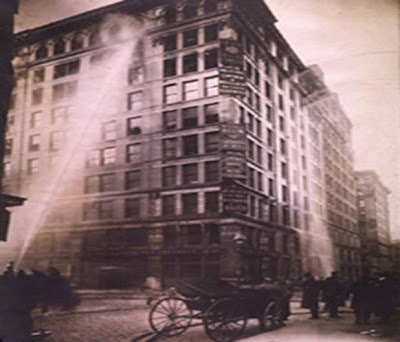 We are rallying on Friday to mark the 100th Anniversary of the Triangle Shirtwaist Factory fire. We will meet Friday the 25th of March at the corner of Ruby, North Division and North River Drive and memorialize each victim in chalk in solidarity, as is being done in New York. It is our hope to also educate the public about the success of Shirtworker's Union, in which a single child worker from the Diamond Shirt Co. Called the 1909 general strike which gave us the 8 hr days we enjoy today. This success, in the face of the tragedy that followed shoes that the success of the movement in 1911 is affected by the future of our struggle in 2011. The labor movement finds success not in a gesture, but a solidarity of cause. The present and future quest for fairness in the American Workplace. 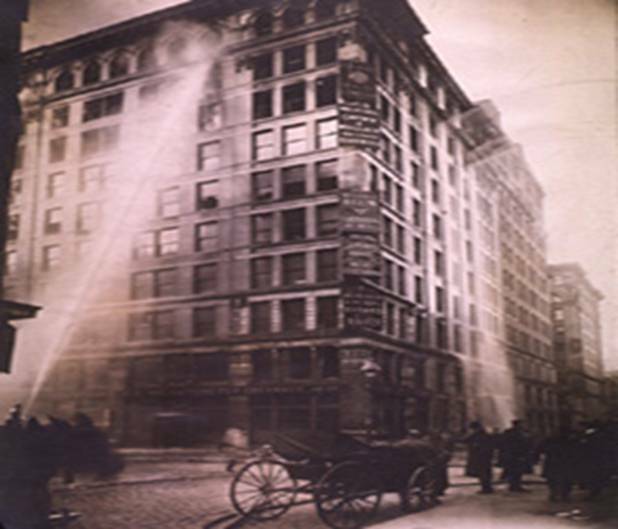 They raced out of the townhouse and ran toward the commotion: a fire at the Triangle Shirtwaist Factory, just off Washington Square. Flames and black smoke shot from the top floors, and as they watched in shock, young girls and women, some alone, some clutching hands, inched up to the windows’ ledges — and jumped to their deaths. The sewing factory employed more than 500 people, who worked long hours for low wages, in wretched and unsanitary conditions. They turned out “shirtwaists” — blouses with puffed sleeves and tight bodices popularized by the “Gibson Girl.” The factory owners had locked the fire-escape doors. The seamstresses were trapped when fire raced through the sweatshop just before closing on March 25, 1911.
, because unionized garment workers received better pay and had safer conditions. And it galvanized Frances Perkins. Twenty-two years later, President Franklin D. Roosevelt appointed her secretary of labor, the first woman to serve as a Cabinet secretary. During her 12-year tenure, she directed the formulation and implementation of the Social Security Act, one of the most important pieces of social legislation in our history. Among other extraordinary accomplishments, she helped create unemployment insurance, the minimum wage, and the legislation that guarantees the right of workers to organize and bargain collectively. She also established the department’s Labor Standards Bureau, a precursor to what is now the Occupational Safety and Health Administration (OSHA). Perkins clearly had the Triangle victims in mind as she weaved the nation’s social safety net. Now I have the same job she once held, with the responsibility of repairing and strengthening that net. And although our passion for workers’ rights came from different paths (she was the daughter of privilege; I am the daughter of immigrant union members), I understand the impact that moment had on her work. I had my own moment involving a sweatshop. Although it was not as horrifying as that afternoon was for Perkins, it fueled my beliefs. In 1995, 75 Thai immigrants were freed from a so-called factory in the city of El Monte, Calif., part of the district I represented in the state Senate. They had been forced to eat, sleep and work in a place they called home. Their employer confiscated their passports and kept them like slaves. Threatened with violence to themselves or their families, the workers hunched over sewing machines in dimly lit garages bound by barbed wire, sewing brand-name clothing for less than $2 an hour. Most of them were women. I met them shortly after they were freed and heard their stories. And at that moment, the unthinkable became real for me. I had assumed that sweatshops were a thing of the past. But they had just spread — from Perkins’s New York City to my Los Angeles, from the Italian and Eastern European immigrants victimized in her day to the Asian and Latino immigrants victimized in mine. Combating garment sweatshops is, sadly, still on the labor secretary’s agenda. In the past fiscal year, the department’s Wage and Hour division conducted 374 investigations and collected $2.1 million for 2,215 workers, primarily in the major U.S. garment centers of Southern California and New York. In these cases, vulnerable immigrant workers have been deprived of minimum-wage pay, overtime pay and safe working conditions — all the haunting echoes of Triangle. We have had many improvements in the past century. Today, we have more tools to pursue violators who deny workers their pay, including issuing subpoenas and preventing companies from shipping goods produced in violation of the law. In 1911, more than 100 workers were estimated to have died on the job each day. In 2010, 4,340 workers were killed on the job — and more than 3.3 million were seriously injured. Last April 5, in a fiery explosion at the Upper Big Branch Mine in West Virginia, 29 miners died in one day. I was at the mine the next day, while rescue efforts still were underway. In times of crisis, one often becomes two people. In one sense, I was simply Hilda, the person I’ve always been, there just to be by the family members’ sides as they kept vigil. In another sense, I was Labor Secretary Hilda L. Solis, trying to convey to them the depth of their government’s commitment. In either case, no words can adequately express your emotion and sympathy. A grief that great can be endured only if it is shared — and then acted upon in good time. Both Triangle and Upper Big Branch became calls to action. New York quickly implemented groundbreaking workplace safety laws and regulations, including fire exits. But nearly one year after Upper Big Branch, the Mine Safety and Health Administration, part of the Labor Department, still needs additional tools that only Congress can provide. And OSHA needs better tools, such as stricter penalties against employers who put their workers’ lives at risk, and stronger protections for whistle-blowers. In both cases, if these workers had a voice — a union — and the ability to speak up about conditions, these events probably could have been prevented, because unions play an important role in making workplaces safer. In both cases, they had tried to organize and faced virulent opposition. Today, workers and their allies are being met with that same kind of opposition. In states nationwide, working people are protesting the actions to strip them of collective bargaining. The Triangle fire and the Upper Big Branch explosion a century later make clear to me that workers want and need that voice — about wages and benefits, yes, but about more, too. Collective bargaining still means a seat at the table to discuss issues such as working conditions, workplace safety and workplace innovation, empowering individuals to do the best job they can. And it means dignity and a chance for Americans to earn a better life, whether they work in sewing factories or mines, build tall buildings or care for our neighbors, teach our children, or run into burning buildings when others run out of them. I’ll be thinking about all of this as I make my way to New York on Friday for the 100th anniversary of the Triangle factory tragedy. The building is still there; it now houses offices for New York University. Thousands are expected to mark the occasion with a march, speeches, the reading of the victims’ names and the laying of flowers in their honor at the site by schoolchildren. It will be a powerful reminder of what we’ve lived through, and what we still have to do. History is an extraordinary thing. You can choose to learn from it, or you can choose to repeat it. For me, the choice is clear, as it was for Frances Perkins. We must always be a nation that catches workers before they fall. affiliation. Spouse and dependents included.